It all began when about 18 feet of green plastic garden hose disappeared into the ground in Mr. George Di Peso’s back garden. Scientists from California Institute of Technology are on their way to inspect the last remaining few feet of Mr. Di Peso’s home, the activities of which have already baffled police and engineers of the local water company. 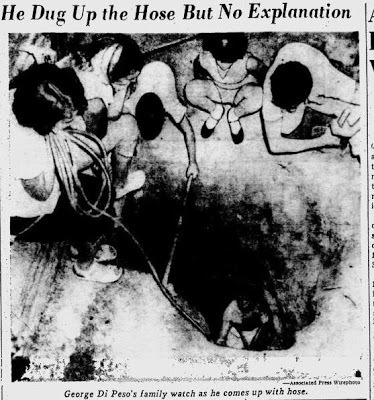 Even an amateur prospector with a Geiger counter couldn’t unravel the mystery of where the hose has been going. Mr. Di Peso has had to rope off his lawn to protect the flower beds from trampling feet. One enterprising tradesman set up a hot dog and coffee stand, while extra police were sent to the Di Peso home to handle the ever-growing crowd. A neighbor, Mrs. Robert Breeze, said that her own hose had started to disappear into the ground last Friday, but her husband had cut it off after 15 feet had vanished.